Apparently, some rivalries never come to an end. Often times, these invented competitions driven by media hype and long winded discussions among fans who are quick to point out their favorite artist’s illustrious pedigree can become trite. On StoryOn’s True Live Show, g.o.d member Kim Tae-woo revived this competitive dead horse temporarily inciting criticism with some bold statements regarding his group’s standing against their storied rival Shinhwa. So why the renewed matchup between these two industry veterans? Well, both groups made their return to the music scene in the past couple of years after extended hiatuses. Shinhwa had a four year break as various members completed their mandatory military enlistment before their comeback album in 2012 aptly titled The Return. Not to be outdone, g.o.d made their own return to the industry with all five members earlier this year after nine years since their last promotions. Both groups have carved out a faithful fandom in an industry that has been inundated with idol groups. 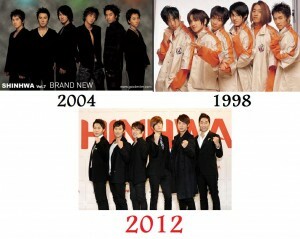 Seoulbeats has previously discussed some reasons as to why Shinhwa has lasted this long as a group. Undoubtedly a draw for both groups to continue putting out new material is their devoted fans. G.o.d even went as far as apologizing to their fans via their song “Sky Blue Promise” due to their extended time away from the scene. Now that these groups have been around for so long, you would think their rivalry is something in the history books. (Side note: He also mentioned that the remaining ten percent would consist of fans for other artists). 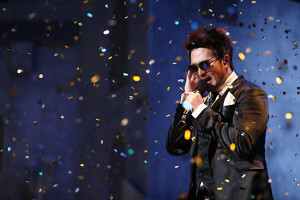 Since his statements on the show, he has apologized to both Shinhwa member Minwoo and Shinhwa’s fans for his remarks – expressing that he should not have taken his statements that far to make a comedic bite in reference to the rivalry between the two groups. Was the g.o.d singer in the wrong with his statements? He definitely was careless, but in the K-pop industry, simply jesting about another group will cause an unprecedented amount of ruckus — especially if the remarks are taken out of context (which they often are). Also, his apology did seem sincere, so for two groups that have been friendly rivals, hopefully his comments do not affect their feelings toward one another too negatively. The intriguing thing that can be derived from this incident is the necessity of rivalry in a group’s story. So many years have passed since they last waged these imaginary battles in the early 2000s, but both groups are still pitted against one another and asked to judge their own success in comparison to that one particular adversarial peer. It is never enough to have them both be judged by their merits alone, but the value is derived from stacking one group in contest with the other. Perhaps this could be a reason why Kim Tae-woo slipped up. It is likely that he has received countless questions that necessitates his opinions on Shinhwa. An idol-like answer that wades in neutral territory will never be satisfactory. The media will continue asking these hard-hitting questions hoping that one day, the idol will slip up and say something bolder. In this case, Kim Tae-woo fell victim to this trap by carelessly joking about the popularity of these two groups. In the music industry, creating this mystique of competition drives fans to action. Music shows have all moved to handing out awards to the act that receives the most points from a set of criteria. These little victories are bullet points in an artist’s resumé. Both groups have amassed a long list of successes, but would either have reached those summits without their opposing peer pushing them to their limits? Did you find Kim Tae-woo’s remarks to be out of line? Which idol groups do you foresee waging these rivalries ten years down the line from now? Music & Lyrics: Orange Caramel and My Sushi are Dada!